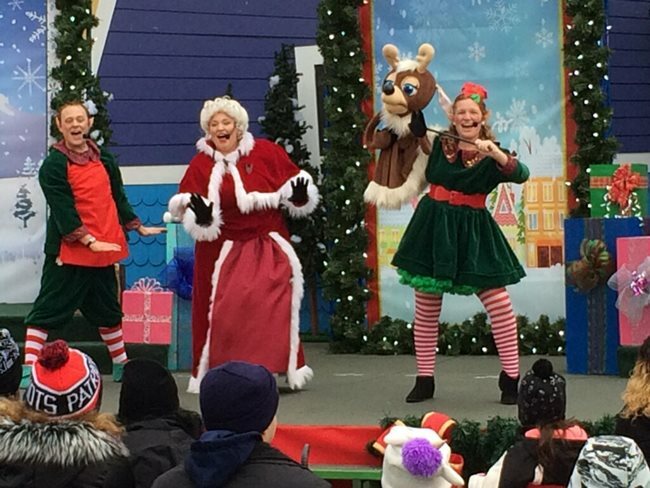 Six Flags New England is open in December for the first time, with a holiday theme. It’s a great time as always. Events INSIDER lists more holiday attractions than anyone: 55 of them in New England! 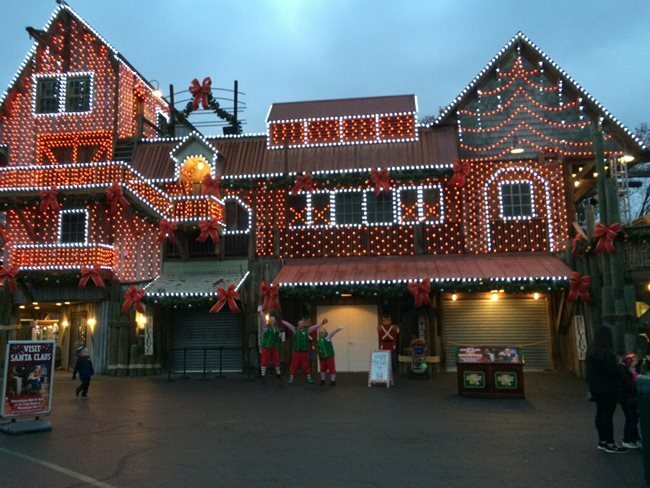 And I’m glad to say that Six Flags is the Best Winter Lights Destination in New England in 2017! This is a lot more than just the park being open for visitors. They’ve put a lot of effort into the holiday theme, with stage performances, lighting, and themed shows. 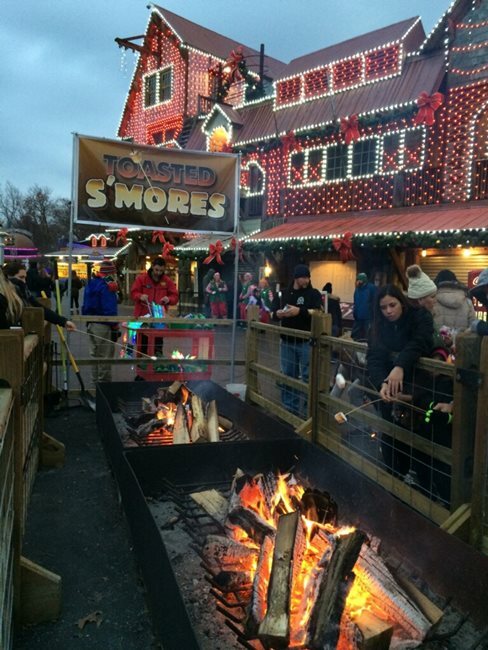 You can toast smores for $5 over an open fire, warm up in front of an outdoor heater, or go inside for food or to buy fudge or toys. Every building was decorated with lights, although there were only a couple of special purpose holiday dioramas, notably a giant tree ornament. The themed holiday areas come with costumed characters and outdoor stage shows that are intended just for kids and we found of little interest to adults. This is what you would expect from a theme park anywhere in the world. Each area was marked as having a ‘scent’ but we mostly smelled popcorn and chill air. I’d be curious to hunt down the scent machines! However, the indoor Frost show is a must see experience! The 11 circus peformances ranged from above average to truly magnificent, jumping on a trampoline, aerial dancing, using a giant pole, dancing with good snap and coordination, and many costume changes. A favorite were the acrobats who balanced on top of each other rather than a metal stand — truly great. To us this was the highlight of the park. Although some of the park was closed due to cold weather, the big roller coasters and big effects were open. Because the holiday event is themed for children, lines were very short for these scarier rides. You’ll find plenty of mid-level rides as well, such as Buzz Saw, which rocks back and forth, bumper cars, and Houdini, where an entire room seems to spin. Note that if you’re overweight, most rides let you settle into the harness and see how much you get squeezed, but Houdini is automatic, so avoid that one to be safe. It’s great though, a real surprise and not too scary. We did find a GoFresh booth with presumably healthier food, but it was closed. 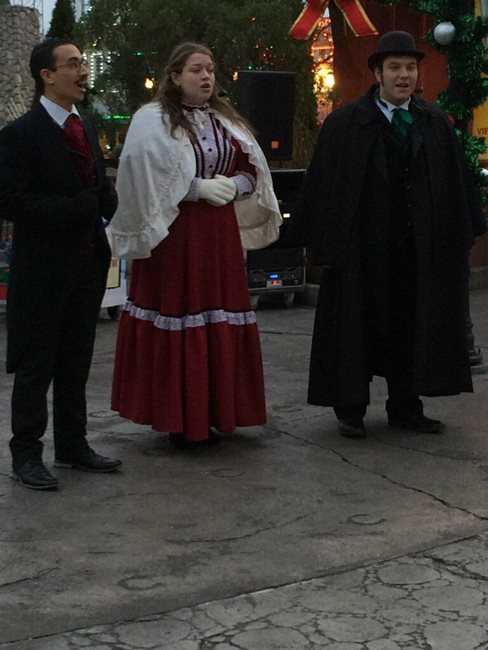 It was lovely to find holiday carolers all throughout the park. Although the displays and shows were secular and generic, my only complaint would be that the music was too religious, and because it’s music, there was really no escaping it in the park. According to the lyrics, you have to fall on your knees for our Savior’s birth, and such, which is not inclusive of nonbelievers, or those of other faiths. Other attractions go more for the Frosty the Snowman songs. 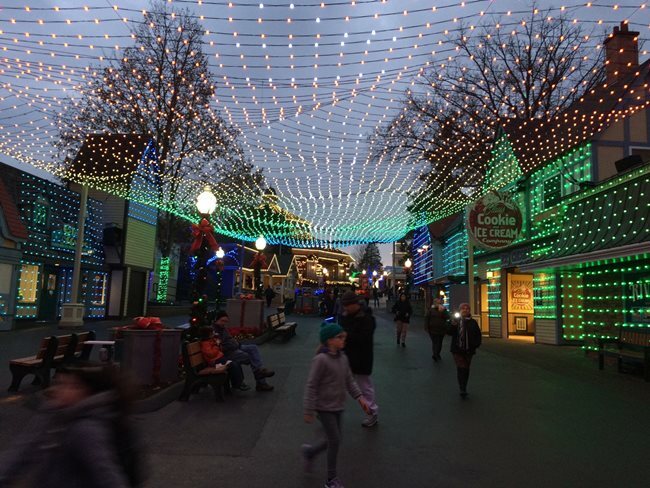 Considering it was their first time ever hosting a holiday event, visiting Six Flags was remarkably mystical, and uplifting time of good cheer. We had no problem staying warm, and saw tons of cute kids. I can unreservedly give another 5 stars. While you’re in the area, go to Bright Nights at Forest Park, too, in nearby Springfield.